The Tavern keeper was present and busy preparing for the halloween banquet the first time I came. His name is Cookie and he is the former owner/operator of Grizzly’s Tavern. He is a most amiable fellow and and aptly able to defend himself. Shortly after taking this picture he went out and dispatched the pictured ettin with his trusty war fork. (Hint, don’t short change the man). Also while waiting, two murderers arrived thinking to make easy work, but were met by several good men and sent packing. HeHe, gotta love that. Cookie has only been in Rivendell for a short time, but seems content and happy to help re-establish the place as a good destination for fine dining, good drink, and the odd inflated story about taking out those two drakes alone. Visited again with the Mage Tower Pub Crawl. 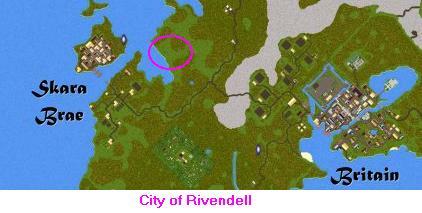 The Mayor of Rivendell (Tavis) was on most of the pub crawl with us, so by the time we visited Rivendell, he was especially BOMBED! He kept walking up to people, putting his arm around them and saying “I love ya man” in hopes of getting more booze.